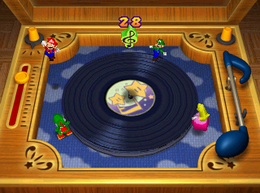 Dizzy Dancing is a 4-player minigame found in Mario Party 2. It is also featured in the minigame compilation game, Mario Party: The Top 100. Its name is a pun on the movie Dirty Dancing. 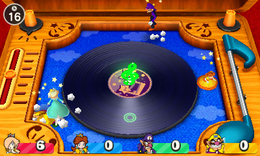 This mini-game's concept is also used in the Mario Party 6 Bowser Minigame, Dizzy Rotisserie. The record on which the players are standing starts spinning, thus knocking them all into their corners and as a result, are now dizzy. They have to grab the clef hovering over the center of the record. Due to the players' dizziness, the controls are altered, and players have to figure out how each direction on the controller translates to the screen. The first player to grab the clef wins. This game can be bought for 150 coins. Gameplay in Mario Party: The Top 100 is different. Players now compete for points in this minigame. The first player to grab the clef gets 1 point, and a new one spawns. After 30 seconds, the player with the most points wins. The winner does their signature victory dance whilst the other players slump in disappointment. There is a separate screen in The Top 100. Game Rules – "The record spins and spins, and so does your head! Be the first of the dizzy dancers to grab the floating musical note." Game Rules (Mini-Game Coaster) – "As the record spins, so does your head! Be the first dizzy dancer to grab the note above the record to clear the game." Advice – "Figuring out which direction to tilt your in to make you walk straight is the key." Description – "Fight through the dizziness to grab the Clef hovering above the record!" On-screen – "Grab the Clef!" This page was last edited on January 15, 2019, at 20:35.